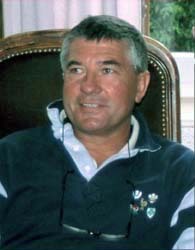 " Philippe was the editor of the bulletin of the French Cichlid Association for 13 years "
Philippe Burnel was born in 1955. He discovered Cichlids 30 years ago. Since then, the passion for them has not leave him. He primarily deals with Cichlids of the Great lakes of Africa, of which he has raised many species over the years. But during the last ten years he has been devoted to South American cichlid species before coming back to his firts love : Tanganyika cichlids . He has written many articles for the bulletin of the French Cichlid Association, of which he was the editor for 13 years. Philippe maintains a wonderful personal home page with articles, cichlid profiles and hundreds of his wonderful pictures.